The key to finding the right tackle storage solution is understanding your unique situation. What tackle do you own? What do you plan on purchasing? What species do you target? Do you shore fish, have a boat or tag along with a buddy who has one? All of these questions will help you identify what you will need to keep your tackle, tools and other accessories organized on your next fishing endeavor. We all know that one angler who has one of everything or who is always trying something new. Keeping everything organized typically turns into a challenge. The Scheels Outfitters Magnum 370 Tackle Bag offers two great solutions to the tackle fanatic. This is perfect for the boat angler who stores all of their tackle in different compartments of their boat and needs to pack everything up for a destination trip or for a day on the water on somebody else’s boat. This is also ideal for someone who does not have a boat, but likes to keep all of their gear and tackle close at hand in one location. Because this tackle bag can hold up to 12 3700 tackle box organizers inside along with 4 outer zip-closed gusseted pockets, 2 large mesh zip-closed pockets, 4 outside slip pockets and 1 interior clear vinyl zippered pocket, there is a spot for everything to help you stay organized! 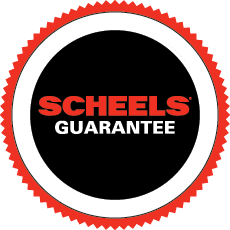 If you are looking for something a bit smaller, or maybe a tackle bag that you can swap out storage containers depending on the day or trip, you need the SCHEELS Outfitters Deluxe Tackle Bag. You can pack all of your components into the included tackle totes and organize your tools in one of the three large zippered side pockets. Elastic mesh pockets hold smaller items for easier access and the front zippered mesh pocket helps reveal some tools stowed inside. A heavy-duty tackle storage solution in a popular camo pattern that will keep your gear protected from the elements and neatly organized for a day on the water, the Flambeau Camo Tackle Bag is a popular option when it comes to a compact storage solution for the traveling angler. We all started somewhere and typically that was with a classic style tackle box. The Plano Guide Series Tackle Box is a classic design with plenty of storage for a day fishing off the dock or for a new angler just starting out. This roomy tackle box features three lift-up trays and a large bulk storage compartment in the base for all of your tools, bobbers and other larger items. For those who fish with minimal tackle and have to navigate through the woods to their secret fishing hole, or if you are an avid fly angler, the Simms Waypoints Sling Pack is your new go to tackle/storage bag. This ultra-light weight design contains a variety of unique features including a 10 liter main compartment, a fold-down workbench and a magnetic tool port for easy access to your pliers or other accessories. The SCHEELS Outfitters Fishing Utility Boxes are a great option when you need to add more or new plastic container storage to your current tackle box or bag. They are also great for organizing different compartments in your boat or kayak. Available in 3 popular sizes: 3600, 3700 or the 3500 twin pack. With their adjustable compartments and durable locks, you can’t go wrong with the SCHEELS Outfitters Fishing Utility Box. The Crank Caddy Tackle Box keeps your crankbaits organized and virtually tangle-free. The plastic boxes feature a flexible, yet durable insert that keeps the crankbaits separated and untangled. With three available sizes you can find storage solution for your different types of bait. The small size holds 42 small crankbaits, the medium size holds 28 medium crankbaits and the large size holds 12 large crankbaits.